Degenerative myelopathy is similar to human multiple sclerosis. The myelin is a protective sheath that surrounds the spinal cord. When it becomes damaged, neurons become exposed. The neurons help the brain communicate with the spinal cord. The communication begins to degenerate, causing lameness in the rear and eventually paralysis. 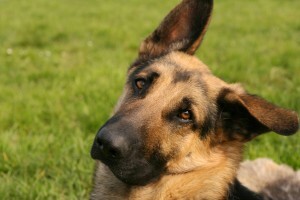 Certain breeds are predisposed to degenerative myelopathy. German Shepherds are #1, followed by Corgis, Collies, Boxers, and Huskies. DNA testing is now being offered by the Orthopedic Foundation for Animals. If you are considering buying one of these breeds, it would be wise to ask the breeder about any problems with the dog’s relatives. This disease can be confused with other problems such as disc disease, arthritis, and torn ligaments. It usually begins with weakness or wobbliness in the rear. Then the owners will observe the dog dragging one or both of its back feet. The nails on the affected feet are usually worn to nubs, and the dog sometimes does not place the foot correctly on the ground. When we test a dog, we will place the top of the foot on the ground to see how long it takes the dog to correct it. Usually, it is by process of elimination that this diagnosis is confirmed. X-ray pictures, spinal taps and bloodwork are used to determine if there is a specific cause for the symptoms. When there is no condition found by the tests and the symptoms are as described, the diagnosis is myelopathy. Dogs usually show signs after 6 years of age and are usually paralyzed within one year. The disease is non-curable, but there are some things that will help slow the progress in some dogs. Various medicines may be helpful. Moderate exercise is recommended. Start slow and build up to a point that the dog can handle. Some doctors recommend walking one day and resting the next. Swimming may also be good for affected dogs.